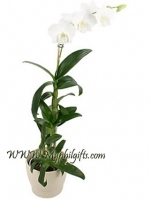 The Dendrobium White Surprise is for a Dendrobium, an extremely large flower. The Dendrobium White Surprise's colour is an even white. This orchid craves a light location, but not direct sunlight.